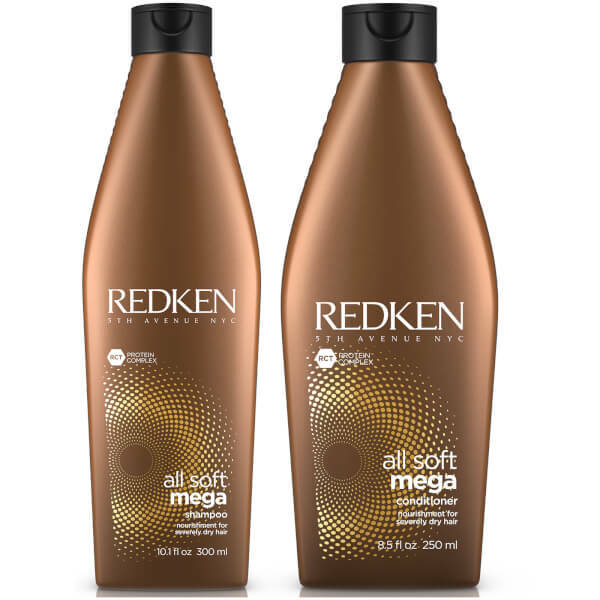 Treat your locks to the Redken All Soft Mega Shampoo and Conditioner Duo; a must-have kit that works to cleanse, hydrate and restore shine, without extra weight or residue. A lightweight, deeply nourishing formula that works to restore softness and manageability. Powered by the brand's exclusive RCT Protein Complex and a blend of Aloe Vera, Cactus Extract and Sacha Inchi Oil, the luxurious shampoo effectively cleanses dry hair, whilst moisturising and strengthening strands from root to tip. Locks feel supple, sleek and hydrated after use. 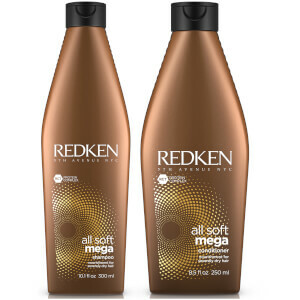 An ultra-hydrating formula developed specifically for dry, medium to thick hair in need of repair. Harnessing the powers of the brand's innovative RCT Protein Complex, the replenishing conditioner delivers intense moisture and hydration, whilst strengthening strands from the root, to the core, to the tip. A nourishing blend of Aloe Vera, Cactus Extract and Sacha Inchi Oil work in tandem to restore softness and suppleness for a sleek, salon-worthy finish. Shampoo: Apply to wet hair, massage into a lather, and rinse. Conditioner: After shampooing, apply to towel-dried hair. Leave on 3-5 minutes. Rinse thoroughly. Shampoo: Aqua/Water, Sodium Laureth Sulfate, Sodium Chloride, Cocamidopropyl Betaine, Dimethicone, Parfum / Fragrance, Sodium Benzoate, Amodimethicone, Carbomer, Glycerin, Guar Hydroxypropyltrimonium Chloride, Trideceth-10, Salicylic Acid, Hexylene Glycol, Glycol Distearate, Citric Acid, Mica, Sodium Cocoyl Amino Acids, Peg-100 Stearate, Phenoxyethanol, Steareth-6, Trideceth-3, Potassium Dimethicone Peg-7 Panthenyl Phosphate, Ci 77891 / Titanium Dioxide, Sodium Sarcosinate, Benzyl Alcohol, Propylene Glycol, Coumarin, Linalool, Peg-45M, Benzyl Benzoate, Hexyl Cinnamal, Limonene, Aloe Barbadensis Leaf Juice Powder, Arginine, Hydrolyzed Soy Protein, Plukenetia Volubilis Seed Oil, Caramel, Acetic Acid, Fumaric Acid, Hydrolyzed Vegetable Protein Pg-Propyl Silanetriol, Cereus Grandiflorus Flower Extract / Cactus Flower Extract, Glucose, Lactic Acid, Potassium Sorbate, Tetrasodium Edta, Bht, Tocopherol, Sodium Hydroxide. Conditioner: Aqua/Water, Cetearyl Alcohol, Amodimethicone, Behentrimonium Methosulfate, Behentrimonium Chloride, Dipropylene Glycol, Phenoxyethanol, Parfum / Fragrance, Benzoic Acid, Trideceth-6, Hydroxypropyl Guar, Potassium Hydroxide, Glycerin, Sodium Cocoyl Amino Acids, Cetrimonium Chloride, Potassium Dimethicone Peg-7 Panthenyl Phosphate, Sodium Sarcosinate, Caramel, Propylene Glycol, Benzyl Alcohol, Coumarin, Linalool, Benzyl Benzoate, Aloe Barbadensis Leaf Juice Powder, Arginine, Hydrolyzed Soy Protein, Hexyl Cinnamal, Plukenetia Volubilis Seed Oil, Limonene, Hydrolyzed Vegetable Protein Pg-Propyl Silanetriol, Cereus Grandiflorus Flower Extract / Cactus Flower Extract, Glucose, Sodium Chloride, Sodium Benzoate, Lactic Acid, Potassium Sorbate, Tetrasodium Edta, Tocopherol.